Russian President Vladimir Putin holds his annual press conference in December, blaming the West for his country's economic woes. While 2014 has certainly been a year where Russia’s President has taken a central position on the global political stage; it is the coming 12 months that are set to see Vladimir Putin’s future decided. 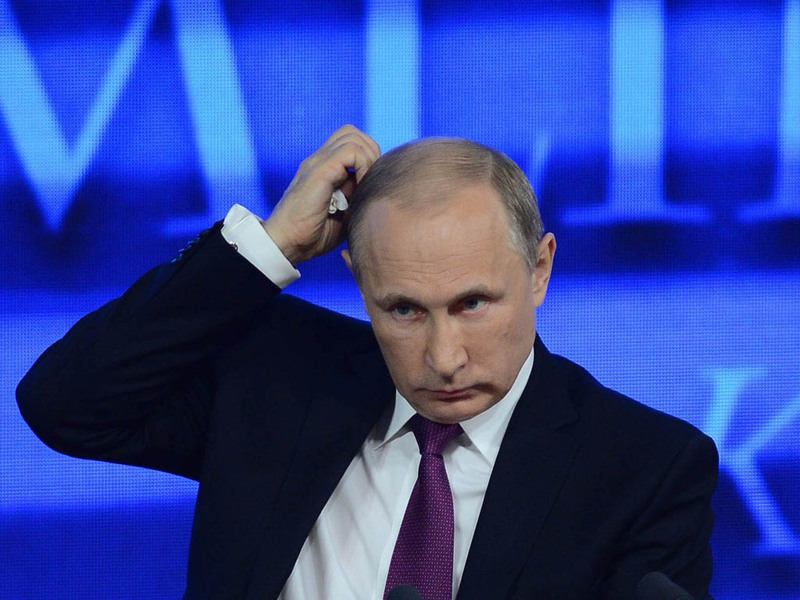 With a rapidly collapsing rouble coming alongside the tumbling price of global oil, Putin’s position has become even more desperate over the last few weeks. Even though his reputation at home remains strong and he enjoys the support of a large majority of the population, a bitterly cold winter exacerbating people’s already drastically reduced household budgets will see many start to blame the president. As 2014 came to an end, Russia’s currency went into free fall, dropping to an all time low against the dollar of 80. Attempts to prevent this by the country’s central bank – including a hike in interest rates of 17 percent – did little to dissuade foreign exchange investors and businesses that Russia’s economy was in serious trouble. Part of the reason for this trouble is the sanctions imposed on the country and the isolationist strategy that Putin has employed over the last few years. Targeted sanctions against wealthy individuals and industry leaders have meant discontent is fostering amongst the elites in Russia. It has backed the country into a corner, with few options. China has been seen as it’s best way out of the economic doldrums, but Russia’s isolated position has meant that it has had to accept far less favourable trade deals with the Chinese over oil and gas. Putin’s decision to ban imports from parts of Europe – particularly food – has also piled on the pressure of already struggling households. In the past, Russians have tended to back their leaders against perceived pressure from the West, despite worsening conditions at home. However, over the last decade there have been many Russians who have spread their wealth across the world, and were that to be jeopardised by Putin’s actions then it’s likely their support won’t be as secure this time. The next year is going to be a make or break one for Vladimir Putin. If he backs down over Ukraine and attempts to mend relations with the West, he will be seen as weak at home. However, if he maintains this isolationist course, it will only cause further economic strife for the country.